We, the undersigned, are dismayed at the continued detention of Dr Binayak Sen, General Secretary of the Chhattisgarh People’s Union for Civil Liberties (PUCL), since May 14. Dr Binayak Sen is also the National Vice-President of the PUCL, one of the oldest civil liberties organisations in India. Dr Sen epitomises a dwindling tradition in India of public health professionals taking health care to the poorest sections and most underdeveloped regions of this country. For the past 30 years, he has been promoting community rural health care centres. He was a member of the State Advisory Committee that piloted a community-based health worker programme in Chhattisgarh. He also helped establish the Shaheed Hospital in Dalli Rajhara, set up and operated by workers for over 25 years. We believe that the arrest of Dr Binayak Sen is a grave assault on the democratic rights movement in India. The PUCL Chhattisgarh has been one of the foremost independent organisations to draw attention to the excesses committed by the Chhattisgarh Government under its Salwa Judum campaign. The fake encounters, rapes, burning of villages and displacement of adivasis in tens of thousands and consequent loss of livelihoods have been extensively chronicled by several independent investigations. Dr Sen’s arrest is clearly an attempt to intimidate the PUCL and other democratic voices that have been speaking out against human rights violations in the State. In recent days, the targets of State harassment have widened to include Dr llina Sen, who for years has been active in the women’s movement, Gautam Bandopadhyaya of Nadi Ghati Morcha, PUCL’s Rashmi Dwivedi, and other activists of the PUCL. Dr Sen has been detained under the Chhattisgarh Special Public Security Act, 2006 and the Unlawful Activities (Prevention) Act, 2004 on charges that are completely baseless. Both these extraordinary laws have been criticised by numerous civil rights groups for being extremely vague and subjective in what is deemed unlawful, and for giving arbitrary powers to the State to silence all manner of dissent. As was feared, these undemocratic laws have been used to target Dr Sen and the PUCL Chhattisgarh. 4. That the Chhattisgarh Special Public Security Act, 2006 and the Unlawful Activities (Prevention) Act, 2004 be repealed. 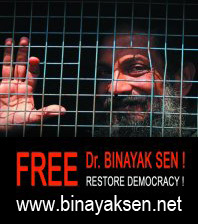 Free Dr. Binayak Sen, Immediately!